Post #22 - Announcing photography auction! I just returned from a 4-day trip to Boston. On Friday the 24th, I delivered a lecture at the annual meeting of the Brookline Bird Club. Founded in 1913, this is one of the oldest and largest bird clubs in the country. With close to 1,200 members, turnout was very good - about 180 people. There was a very interactive question and answer session following my 50-minute talk, and I had the chance to catch up with many old friends and meet a few new ones as well. On Sunday, I visited Hunt's Photo and Video in Melrose (just north of Boston) to kick off a 5-week exhibit of some of my work from my bike trip last year. Excitingly, all of the 14 images are up for auction. They are beautifully mounted and will be shipped to the highest bidder. All of the proceeds go to The Conservation Fund and the American Birding Association. I DO NOT GET A PENNY! This is a great way to help conservation efforts while obtaining a unique photo from what I think was an incredibly journey last year. They would make great gifts for any bird or nature lover. The auction ends on May 29. Here are a few shots of the galley at Hunt's to give you an idea of how the photos appear. We are, finally, just about settled in LA. This past weekend I was able to sneak out for 2 mornings of birding and photography. I am very lucky in that we live right next to the freeways. This means that getting around is exceptionally easy early on weekend mornings when there is basically zero traffic. On Saturday I headed to Bolsa Chica Wetlands in Huntington Beach. This spot is roughly 20 miles south of Norwalk (where I live) and took just 25 minutes to reach. Many folks in my photography network have recommended this spot despite the abundance of unbirders. I arrived just after sunrise and spent the better part of the next 5 hours familiarizing myself with the area. There is a decent diversity of birds, and, they appear, importantly for photography, to be relatively tolerant of people. At one point a Forster's tern hovered 3 feet above my head before landing just a foot to my right on the wooden boardwalk! Just birding casually, I tallied 46 species during my visit (eBird checklist here). In full disclosure I spent more time studying lighting conditions than I did birding. By the time I got it mostly figured out the sun was pretty high in the sky. 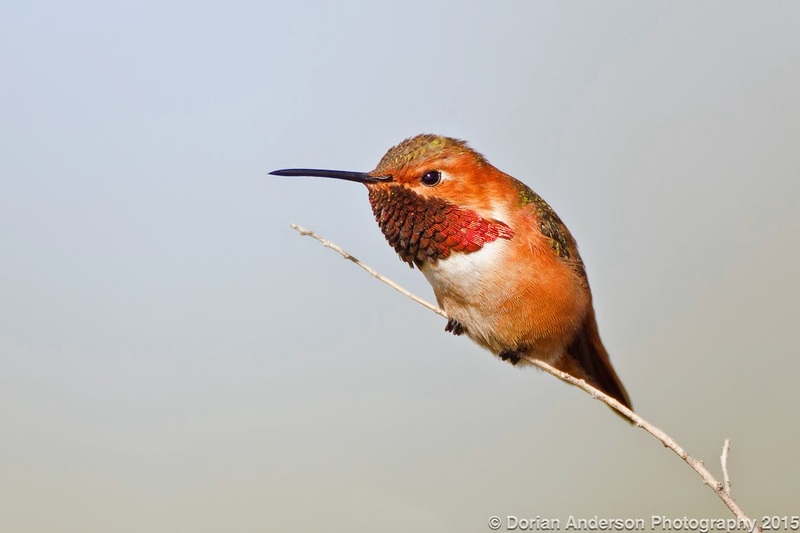 I did manage to walk out with one nice shot of an Allen's hummingbird. All in all I think Bolsa Chica will become a regular spot in my rotation. It's close, has lots of birds, and is photo friendly. I can't really ask for much more! Sunday I headed to San Joaquin Ecological Reserve in Irvine, CA. Very close to the 405 Freeway, this fantastic spot is just 30 mins from my apartment. Heavy cloud made photography difficult, so I focused a bit more on birding on this day. I was really surprised with the mix of birds on the grounds. There were the expected shorebirds, waders, gulls, terns, and, pelicans. I also found 2 Least bitterns, 2 Soras, and land birds such as Black-headed grosbeak and Ash-throated flycatcher. I ended up with 54 species for the morning, but I am sure I missed a number of things that were present (eBird checklist). 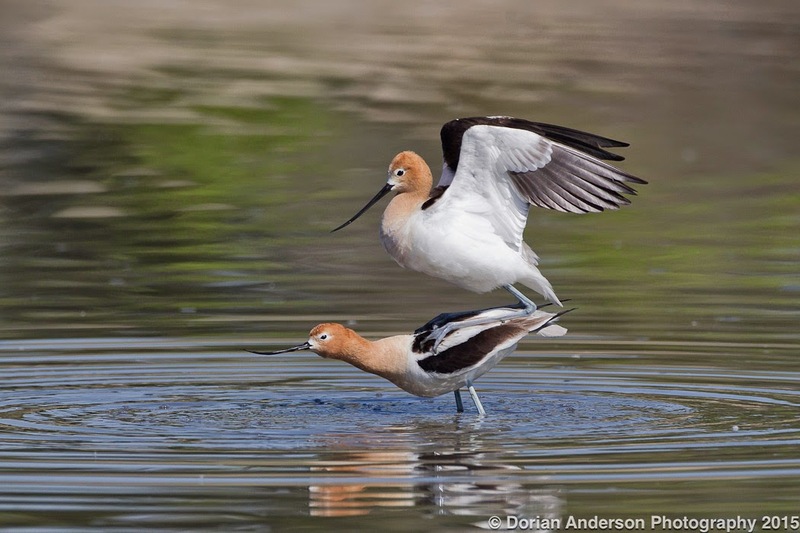 The highlight of San Joaquin was certainly the courting/mating avocets. There was constant activity as they chased one another around for the better part of the morning. I will certainly be returning to this spot in the next few weeks - particularly once the avocet chicks hatch! This shot was taken in very harsh 11am light from quite a distance. It shows the mating behavior well, so I figured I would share it anyway. Here is another fun behavior shot, again in less than awesome light. 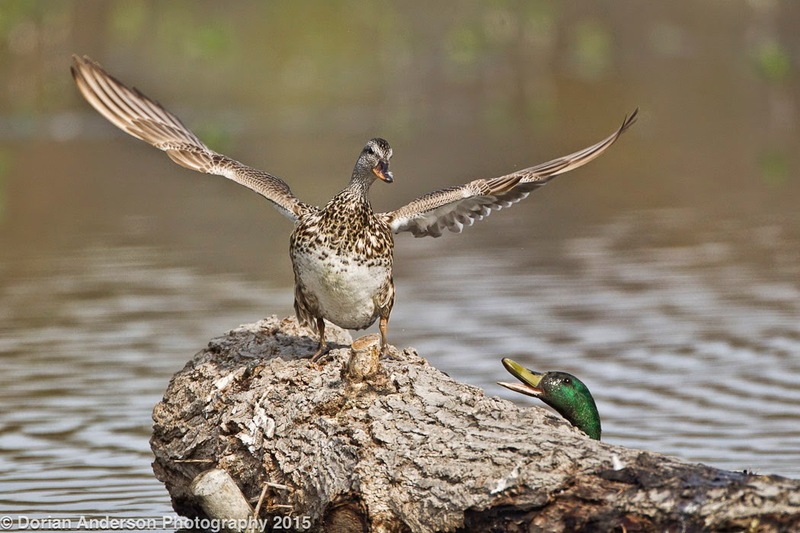 This is a male Mallard scaring a female Gadwall off a log. All I can think is "AFLAC!" Interestingly, both Bolsa Chica and San Joaquin are the result of extensive engineering projects designed to create wetlands. 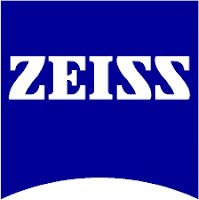 They have been incredibly successful and should serve as models for additional projects moving forward. I will be in Boston this weekend for a series of talks/event that center on the bike trip from last year. I'm really looking forward to speaking at the Brookline Bird Club Annual Meeting on Friday night and to making an appearance at the Hunt's Photography flagship store in Melrose, MA on Sunday morning. I will certainly squeeze in some birding as well. Hopefully I can get a nice shot of early eastern warblers since I'll miss them all once I return to California on Monday! Post #20 - Ivory-billed woodpecker, Passenger pigeon sightings! Sonia and I moved into our new digs in LA at the end of last week. We are getting settled and hope to do some local birding this weekend. I spent Monday of this past week in Ann Arbor Michigan where I spoke to several groups of students and faculty about my biking and birding adventure from last year. In my various talks, the main point I tried to convey to the students was life is often a lot less linear than we make it for ourselves. There is room for exploration, diversion, and even failure. I additionally tried to stress the importance of travel in one's personal development. As I told them, my adventure last year will ultimately prove more valuable than any of my various degrees from or tenures at academic institutions. During my campus visit, I was fortunate to be given a behind the scenes tour of the bird/ornithology collection at the University of Michigan Museum of Natural History. This was conducted by long time collection manager Janet Hinshaw. She took me through both the egg and nest collections before we examined a number of actual bird skins. Her knowledge of bird ecology and evolution was simply extraordinary, and I listened intently to the interesting information that she dispensed with such apparent ease. It was fascinating to learn how brood parasites (some cuckoos, cowbirds, etc) can influence egg evolution. Brood parasites lay their eggs in other birds' nests. These nest parasites rely on egg mimicry to camouflage their eggs among the host's own eggs. The hope is that the host won't recognize the foreign egg and will raise the chick that hatches from it as its own. In the absence of nest parasites, the clutches of eggs laid by individual females across a given species appear remarkably similar. There is no selective pressure to deviate from the mean. However, when brood parasites are present, clutches of eggs from different host females can vary widely in appearance. This ensures that no matter how the eggs from a given nest parasite look, they will stand out as foreign in at least some fraction of hosts' nests. In this way, the hosts stay one evolutionary step ahead of the nest parasites. Pretty cool stuff! I also had the chance to handle bird skins from extinct species. I handled Passenger pigeons and Carolina Parakeets. I also examined an Ivory-billed woodpecker and a Bachman's warbler, two species that have not been formally declared extinct but should be probably considered so for most practical purposes. Both Janet and I agree that it is important to keep these last 2 birds in the field guide just in case someone finds one of them - somewhere. Part of the point of this blog is to raise awareness for birds and their conservation. Hopefully, I'll do at least something to ensure that more species don't disappear in the near future. Then there was this big thing (see below). 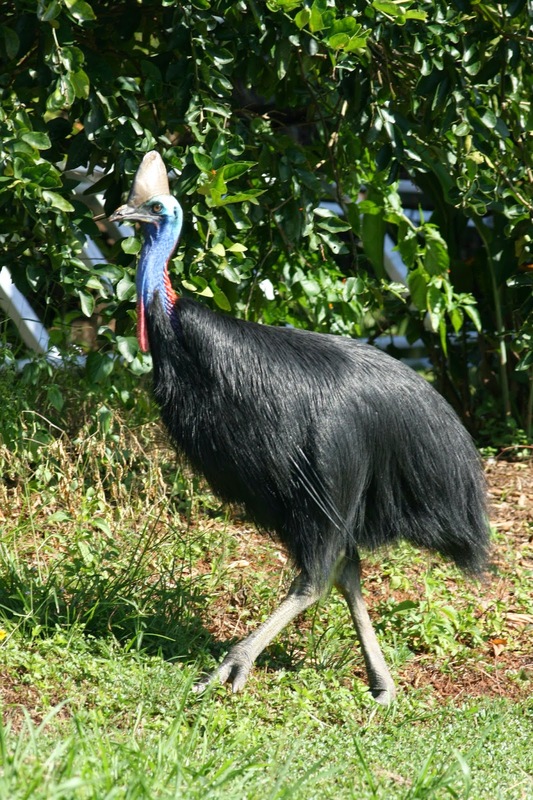 No it's not a dinosaur, its a Southern Cassowary. These five foot tall birds live in the Australian tropics. Sonia and I were fortunate enough to find 3 of these on our 2010 trip to OZ. I can say with certainty that the Southern cassowary is the oddest bird I have ever seen in the wild! Just for fun, Janet also showed me Harpy eagle. These huge birds of prey live in Central and South America where they feed on monkey and sloths, among other animals. Check out how big the feet and talons are! After showing me some of the more popular birds in the collection, Janet asked if there was anything else I wanted to see. "Red-bellied woodpecker" was my response. I chose this rather common bird for a very specific reason. Sonia (my girlfriend) goes crazy every time we see this species. She always complains that it should be called Red-headed woodpecker. She knows that that name is already taken by a properly Red-headed woodpecker, but she points this out every time anyway. Well, how did the Red-bellied woodpecker gets its name then? The answer is that many birds were named from their skin specimens. In collections, these lie exclusively on their backs. When looking down at a these skins, Red-bellied woodpecker makes perfect sense. From this view no one would have thought to name it Red-headed or Red-capped woodpecker! My visit was clearly lots of fun and very informative. I want to send out a personal thank you to Janet Hinshaw for the tour, as well as to Tim McKay who invited me and organized my whole visit. The University of Michigan looks like a really great place to live and learn! I hope to visit sometime again in the future. 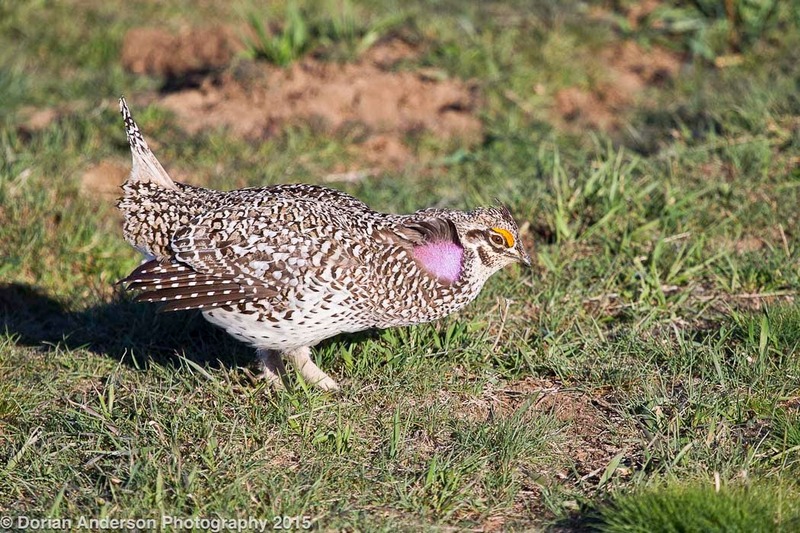 Post #19 - Last installment of Colorado grouse - Sharp-tailed! Reminder, please "like" The Speckled Hatchback on Facebook for updates! Sonia and I are now fully settled in Los Angeles! As I have been consumed with moving, furniture procurement, and unpacking, I am only now able to catch-up on the last of my birding exploits on the back end of the cross-country drive. I am hoping to find some time this weekend to sneak out for my first full-fledged California birding session. I will be sure to keep everyone posted when I do! After wrapping up with the Greater sage-grouse in Coalmont, Colorado, Sonia and I turned our attention west towards Craig. 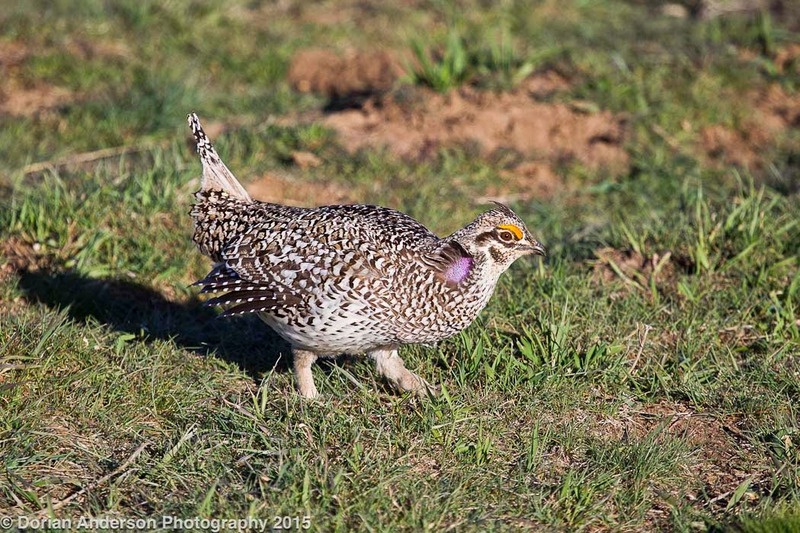 It was here that I fortuitously managed to find Sharp-tailed grouse last July (2014). That encounter, like most of my grouse sightings, consisted of several flushed birds flying away from me at great velocity. The looks were good enough to identify and count the birds, but they unsurprisingly left much to be desired. I was hoping for a bit of redemption this spring. I was not disappointed. Leaning on some of my local contacts, I was again able to secure permission to bird the Trapper Mine, a very large coal operation just south of Craig. We arrived very early in the morning. Placing a small blind near an established lek, Sonia and I spent the better part of the next 3 hours surrounding by upwards of 60 Sharp-tailed grouse. 90% of the birds were males. On the rare occasions when a female did venture onto the lek, she was immediately mobbed by half a dozen males. In each instance, her patience for aggression short, she took to the air to escape the horny suitors. I guess it really wasn't that different from the juvenile behavior displayed by young men at some times! Of grouse encounters of that previous week, this might have been the most impressive. Not only were the birds literally at out feet, but the preponderance of males on the lek made for constant skirmishes between them. At several points, I thought the combatants might end up in the blind with Sonia and I! The constant foot stomping, wing flapping, and squawking made for an incredibly entertaining morning! Despite the close proximity of the the birds, photography at this particular lek proved quite challenging. 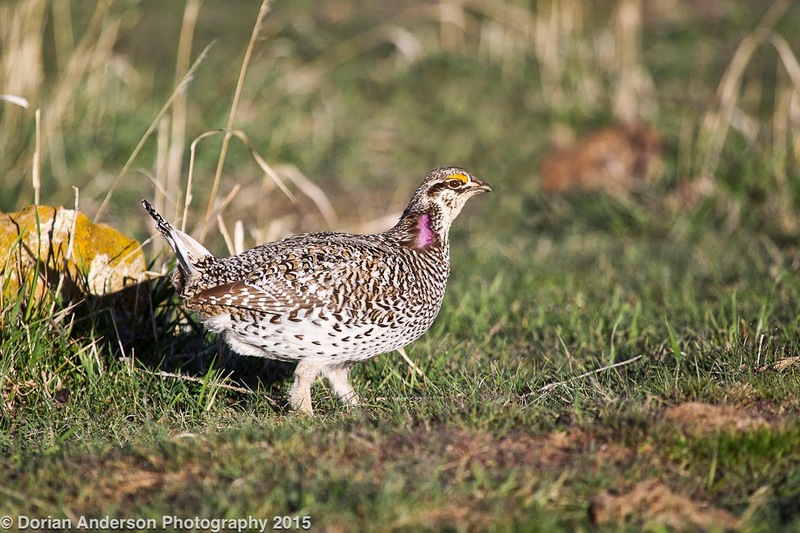 This lek, like the first Greater prairies-chicken lek I visited, was situated on the crown of a hill. I had a really hard time avoiding hard shadows in my shots. There was also some very high grass that cast some very long shadows across the lek. One thing that week taught me was that it is really important to visit the lek site before you actually show up to shoot. As Trapper is a restricted access site, I only got one crack at it. Hopefully, if I return again, I will be a bit better prepared. Since we were already at the mine, Sonia and I took a tour of the whole operation. While I am admittedly a big proponent of more renewable energy sources, coal is, for better or for worse, a big source of the power we are able to generate at this time. Interestingly, all of the leks on Trapper's property are on reclaimed ground. Trapper has made a very nice effort to repair the habitat once they extract the coal that lies beneath the surface. They have actually received several awards for their commitment to environmental management and reclamation efforts. Regardless of how anyone feels about coal as an energy source, it is nice to know that at least this mining entity is trying to conduct itself in an partially sustainably manner. In the next installment of this blog, I'll be holding an Ivory-billed woodpecker......stay tuned! 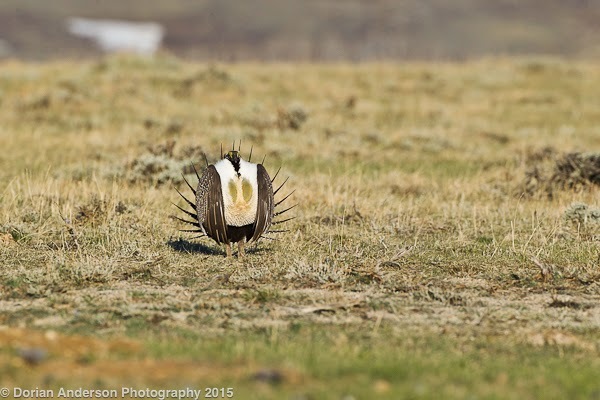 Post #18 - Greater sage-grouse showcase in Coalmont, Colorado! First, I have created a Facebook page for The Speckled Hatchback. Please take two seconds to "like" it here. The more "likes" I can amass, the more potential there will to pull other people and organizations into the fold on the birding and conservation fronts. It will also be a main pipeline through which I disseminate information moving forward. If you use already Facebook, please think about helping me with this, I would really appreciate it! OK, on with birds! 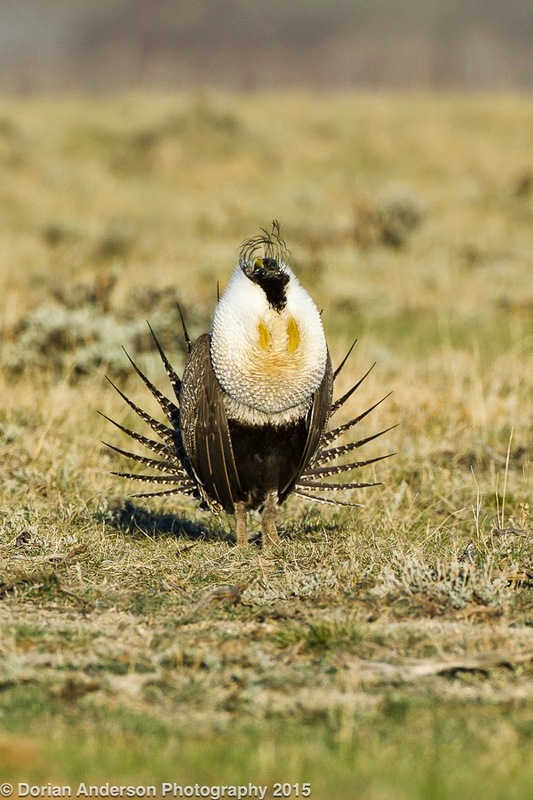 Greater sage-grouse was a bird that gave me nightmares during my bicycle Big Year. 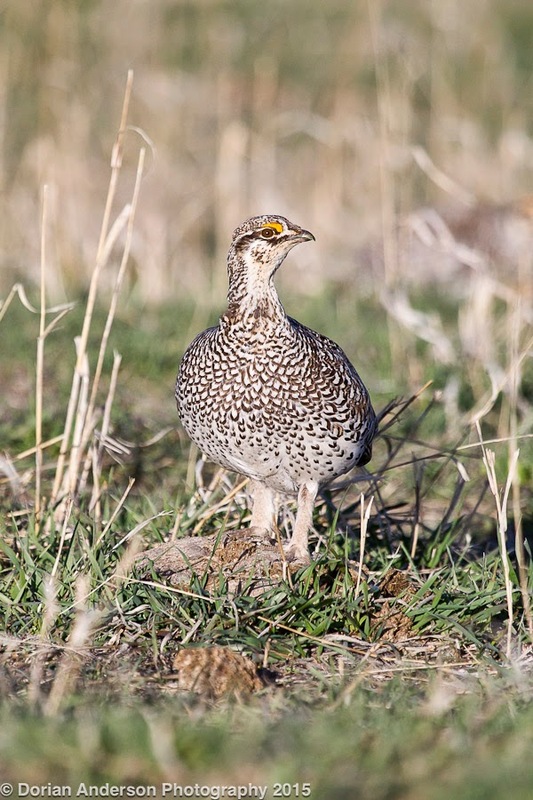 I spent countless hours tramping through appropriate sage habitat at a number of locations, mainly in Colorado, before I was finally able to flush about a dozen of the large but surprisingly sneaky grouse just north of Vernal, UT. This find was particularly meaningful as Sonia was visiting me during that time. She was able to share in the excitement as I finally ticked this species for year bird #503. It’s funny that she was present for a piece of the Colorado legs both this year and last. We both agree that if we don’t live on either coast, Colorado would probably be our destination of choice. 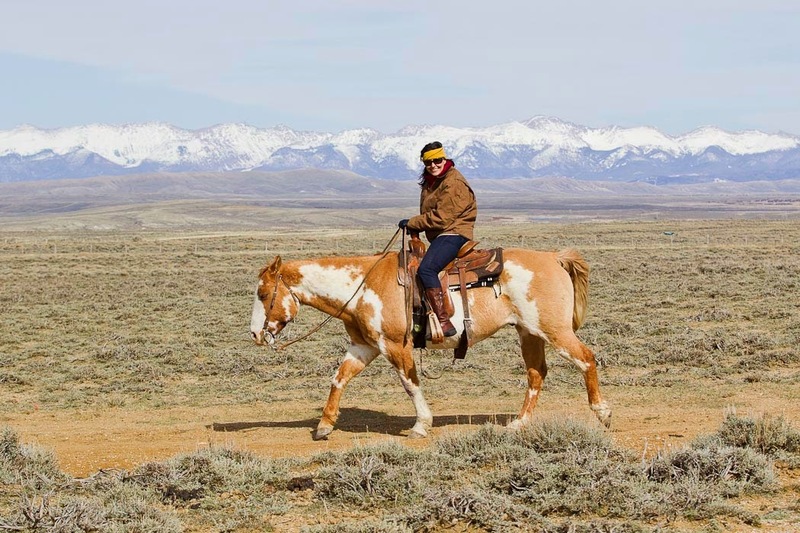 During my exhaustive sage-grouse search last year, I made friends with a couple of property owners in Coalmont, Colorado. After my visit last year, they invited me to return to their home whenever I wanted to search for grouse. This is a particularly outstanding invitation as they have a number of leks on their property! As I was passing through the area on the cross-country drive, I decided to take them up on their offer this year. 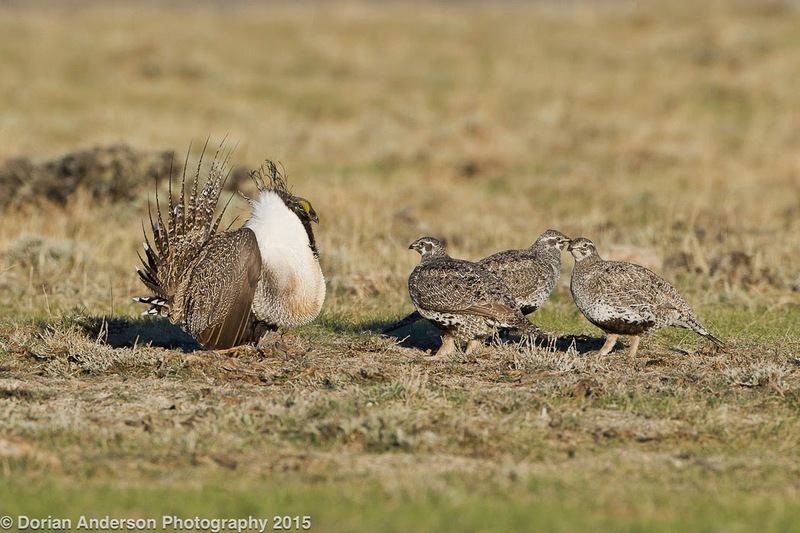 To get right to the point, finding Greater-sage grouse on their property and along the nearby Route 26A was criminally easy. Between 2 large leks, Sonia and I counted well over 100 individual birds. We didn’t even have to leave our cars for fantastic views. If anyone visits these areas in the future, I strongly suggest that you view the birds from your car. First, they don’t really seem to mind people as long as they/you are in cars. Two birds walked within 10 feet of my car! Second, you don’t want to be the moron that gets out and scares the birds off. 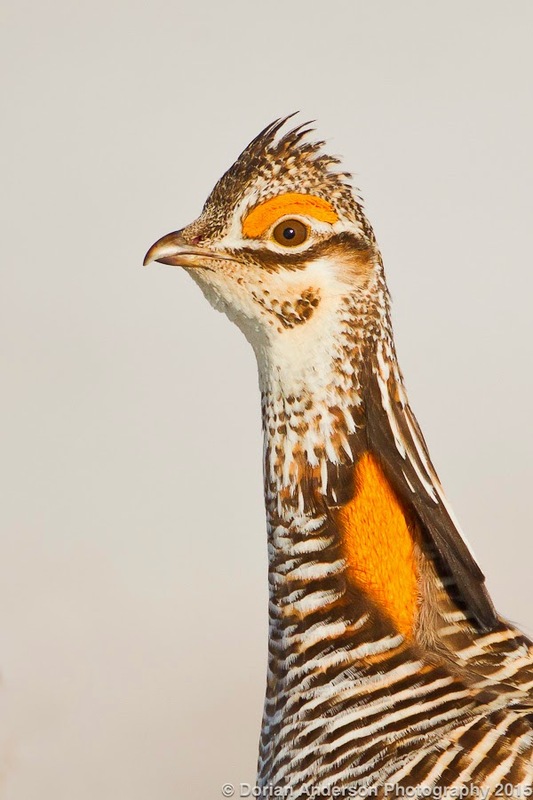 It’s not good for the birds, and the other birders are likely to give you an earful. As incredibly entertaining as fights between birders can be, it’s probably better that we avoid them by being on our best behavior under circumstances such as these. This shot should give you an idea of the setting! Apparently, spring came quite early to Colorado this year. While temperatures this morning started out at 22F, they climbed into the high 30s once the sun rose. This made for very pleasant viewing as the birds strutted for the better part of 2.5 hours. Birds arrived along route 26A around 5:45am, roughly an hour before sunrise. They stayed until around 8:15 at which point all of the ~60 birds had disappeared. The trick, like all grouse, is to get there early! If you go, plan to arrive at least an hour before sunrise to give the birds sufficient time to adjust to the presence of your vehicle. If everyone does this, it makes for better viewing for all. Sonia and I spent that afternoon hacking around Coalmont and Walden. 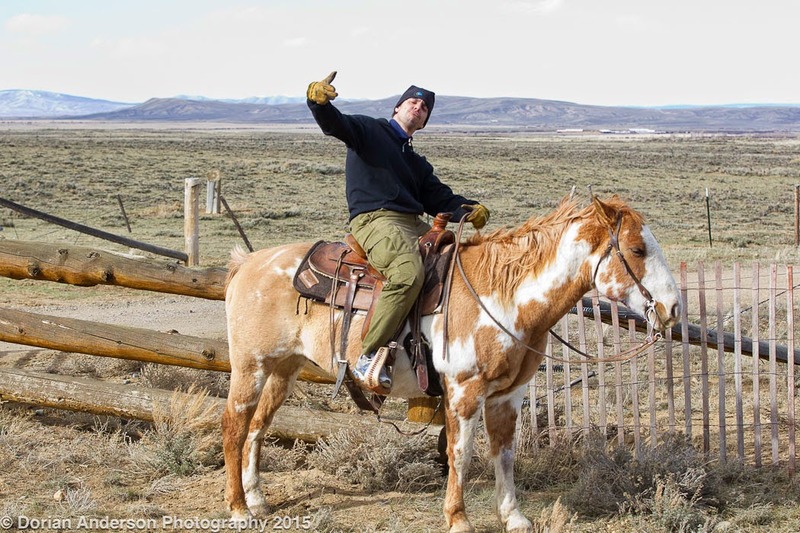 We each took a turn on our hosts’ horse (Hondo). He was quite docile so even a citiot (city + idiot) like myself could handle him. The day was rounded out with 6 moose as we made our way towards Craig and Sharp-tailed grouse. Sonia's exposures need a bit of work! 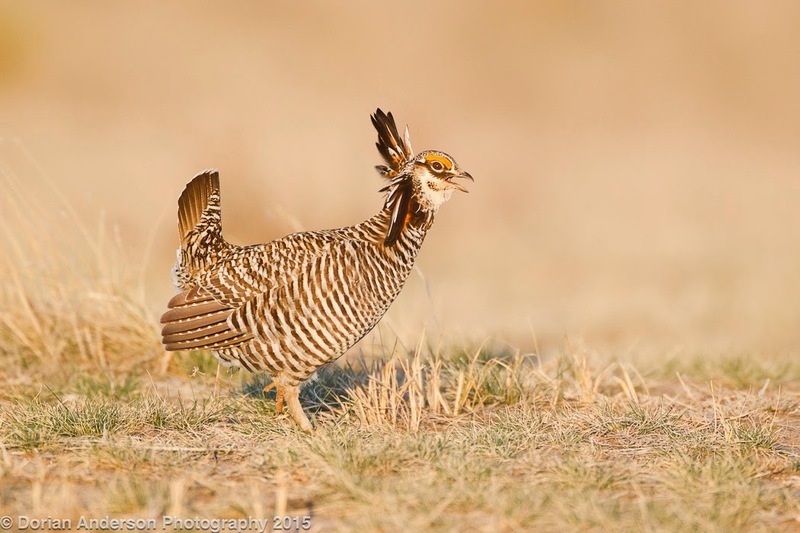 After my great success with Lesser prairie-chicken (LEPC), I turned my attention to its slightly larger and generally more common relative, the Greater prairie-chicken (GEPC). 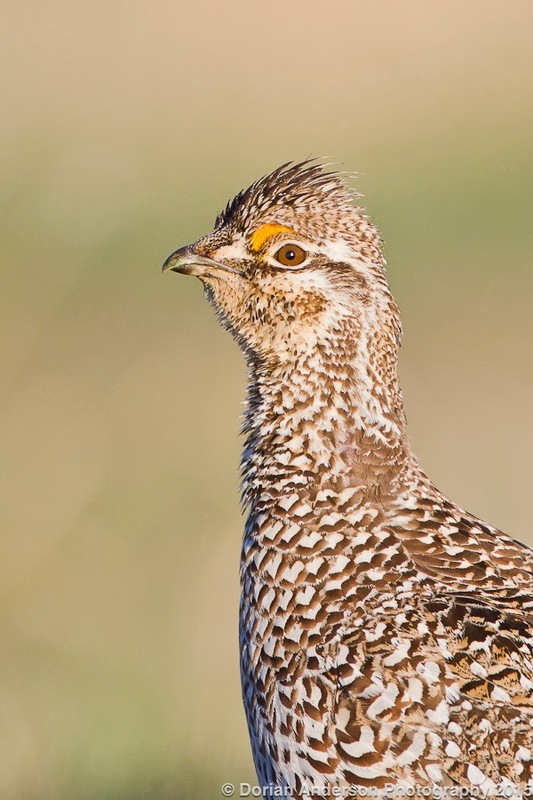 This bird has a significantly wider distribution that the LEPC, but few places are as productive for it as the sand-sage north of Wray, Colorado. It was there that I headed after Dodge City (KS). 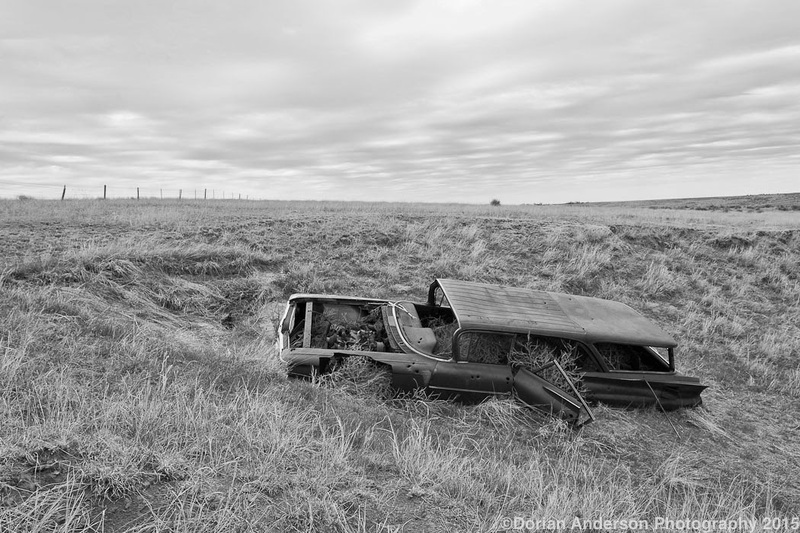 One of the things I love about the American West is the preponderance of old stuff left to decay in farm fields. From an environmental standpoint it can be a bit depressing, but from a photographic viewpoint all this old junk provides countless opportunities to showcase the historical interaction between Americans and the land they inhabit. Unfortunately, most of these finds are fortuitous and as such must be photographed in whatever light presents itself at that exact moment. This means a lot of washed out, midday shots on which I elect to pass. As I approached Wray from the south, I found this amazing old station wagon along Route 395. The cloud cover muted the harsh light just enough that a 2pm shot proved workable. This shot reminds me that whatever damage we humans do the landscape, nature will, given enough time eventually find a way to triumph. I arrived in Wray on Thursday afternoon. Local landowners had put me onto 2 GEPC leks that they thought would be particularly productive from a photography standpoint. One was on the crest of a hill, and the other was at the bottom of a bowl. This will prove relevant in a bit. I scouted both empty leks on that afternoon so that I would have an idea of how to play things the next two mornings. Luckily, the forecast for both days was clear which meant I would have nice light for my shoots. It snowed about 2 inches Thursday night. I was stoked since I thought the snow would add some interesting character to whatever shots I could get on that first morning. Sunrise on Friday was at 6:30am, so I decided to be at the lek area at 5:15am. This would give me the chance to settle in before the birds arrived. It was pitch black when I arrived, and I hunkered down in the snow for the next 3 hours. Birds started arriving well before sunrise, and eventually about a dozen males were strutting around from 20-60 feet from me. The sun eventually crested and gave me the light I would need for my shoot. The problem was that I had in the pitch black miscalculated the curve of the hill and found myself too low with respect to the birds. This meant most of the birds were hidden behind the hill’s crest where photographing them was impossible. There was also a lot of foliage at this site making clear shots very scarce. After 2 hours one bird did run up onto the hilltop. This was the only clear shot I had all morning so I had to make it count. I was able to crack off about a dozen frames before he ran off. These were the only shots I took in the 3 hours that I lay relatively motionless in the snow. Luckily, they proved to be nice! The first shot is the full frame. I wish I had a bit more room at the bottom, but I think the OOF (out-out-focus) snow helps to mitigate this technicality. 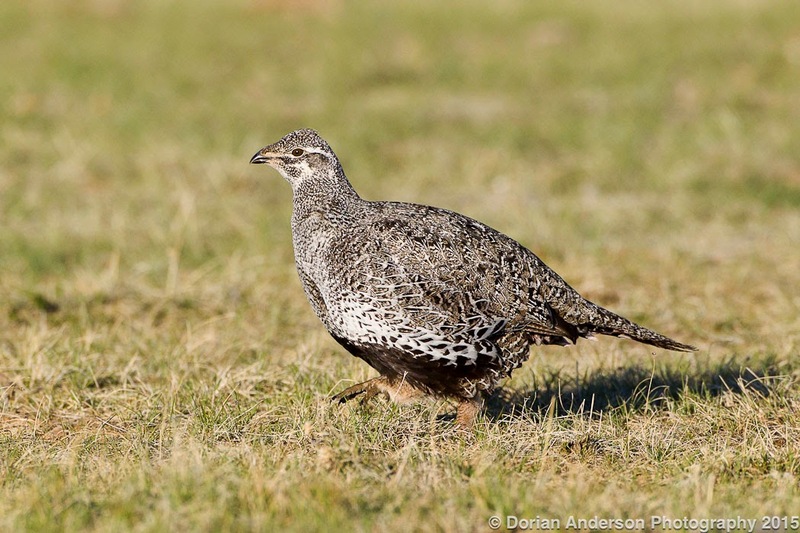 Once the lek started to break up around 8:30, I slinked down the hill and headed back to my motel for a nap. Late that afternoon, Friday, I revisited the second lek, the one at the bottom of the shallow bowl, to make sure no such topographical miscalculation occurred when I visited it the following morning. There were quite a few birds strutting around that evening, and I made careful notes from several hundred yards away as to what areas the birds preferred. I noted a nice raised area surrounded by some grass that looked like it would be a relatively concealed but productive perch. It was about 16 fenceposts west of a particularly obvious bush. I would need to count these posts in the dark the following morning to find the spot I had eyed through my scope that afternoon. I also noted that there was much less grass and sage at this lek. I hope this would translate into unobstructed shots the following morning. I returned that spot at 5:15am to get ready for my second shoot. The temperature was 29F. Lying on my belly in the grass (Thursday night’s snow had melted off by Friday afternoon), I though I was hallucinating when the moon disappeared. Something was off, but the sound of arriving and displaying birds distracted me from this astronomical aside. There were birds all around me. Their eerie booms and constant cackles sounded like something other-worldly. As the sun slowly rose, I was finally able to attach feathers to each source of sound. The birds today were very tolerant of my presence, and they even permitted a bit of crawling so as to reposition myself for clear shots. This shoot proved to be fantastic, and I walked out with a number of really nice frames. Females were in very short supply; They probably represented 6 of the ~30 birds that were present. At one point just before sunrise a coyote ran right through the lek and put all the birds up. Unfortunately there wasn’t yet enough light to shoot this very beautiful and health looking canine. It was a perfect morning even before I figured out I had witnessed an eclipse! With these huge successes behind me, I left Wray midday to head towards Denver. Sonia was flying in to do the last segment of the cross-country drive with me. 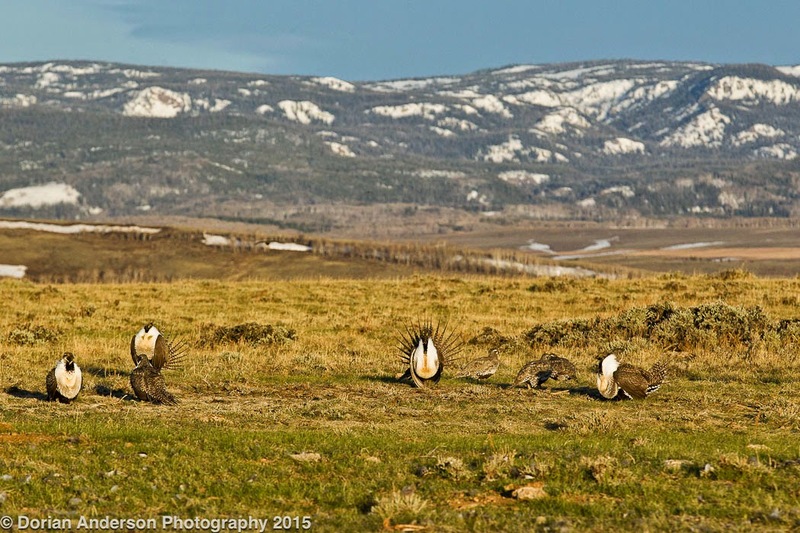 I collected her at the airport and headed west into the mountains where we would seek the next prize, the Greater sage-grouse……..
Post #16 - To Kansas and Lesser-Prairie chickens! Hello Everyone! I am sorry it has been so long between entries, but sometimes life gets in the way of birding. I spent the end of last month in Boston packing our stuff from our storage locker into a ship-a-cube-type-thingy to be carted across the country by some third party (ABF). Our whole life essentially fit into a creatively-packed 330 square feet (6x7x8)! Since then I have made steady progress westward en route to Los Angeles. 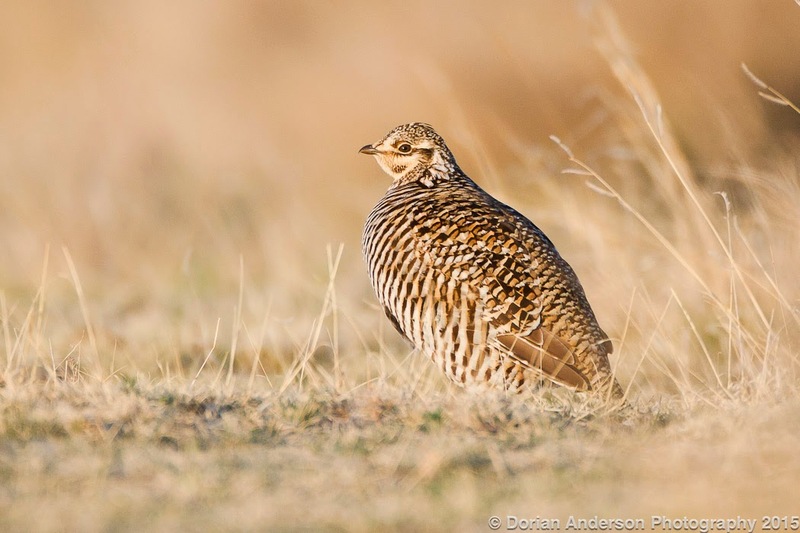 While late-March and early-April mean relatively slow birding across the continent, grouse provide a very welcome exception to this generalization. With this is mind, I slowed my westward pace as I reached Western Kansas. 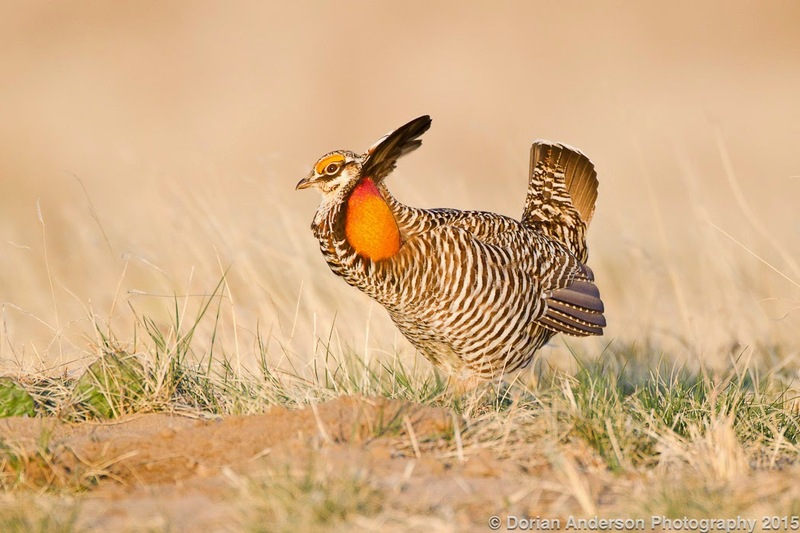 Here, I hoped to rendezvous with my lifer Lesser prairie-chicken. I will say that driving across the country presents some distinctly different impressions than biking across it. I forgot how much ground a person cover in a car. For example, on Day 2 of this journey, I covered ~730 miles from Philadelphia to Marshall, IL. This took approximately 11 hours. At a challenging but manageable 81 miles per day, this distance would have would have likely taken 216 total hours - 9 full days - on the bike. Using these numbers, this means that driving is 20 times faster than biking! In a car, I am also able to largely ignore the wind forecast and road conditions. These variables mean everything to a cyclist and virtually nothing to drivers. The ability to ignore these complications is further testament to how easy cars make our daily lives. Unfortunately, this ease comes with a price, a price that the environment ultimately pays. If we acknowledge this price, we are in a better position to think about how each of us might minimize it moving forward. Interestingly, I did not visit any points between Philadelphia and Dodge City last year on my bicycle Big Year. Despite the great birding to be found at many of these points, I bypassed most of the midwest due to time constraints. My first birding stop on this westbound run was a quick and casual visit to Horseshow Lake just outside St. Louis. This stop was motivated purely by Eurasian Tree Sparrow, an introduced species I have seen only once before (on my first cross country drive from Palo Alto to Boston after college). After ticking this bird (for what list I am not sure! ), I continued west towards Dodge City, KS. 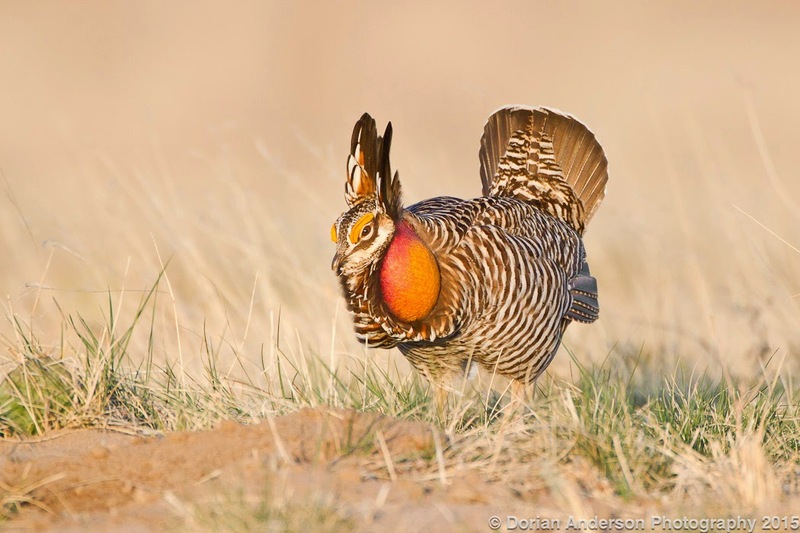 Lesser prairie-chicken (LEPC) is a grassland bird that has experienced great declines in its historical numbers. One piece that I found online puts current population levels at 15% of those in the early 1800s. Not surprisingly, habitat destruction is cited as the prime reason for this alarming drop. 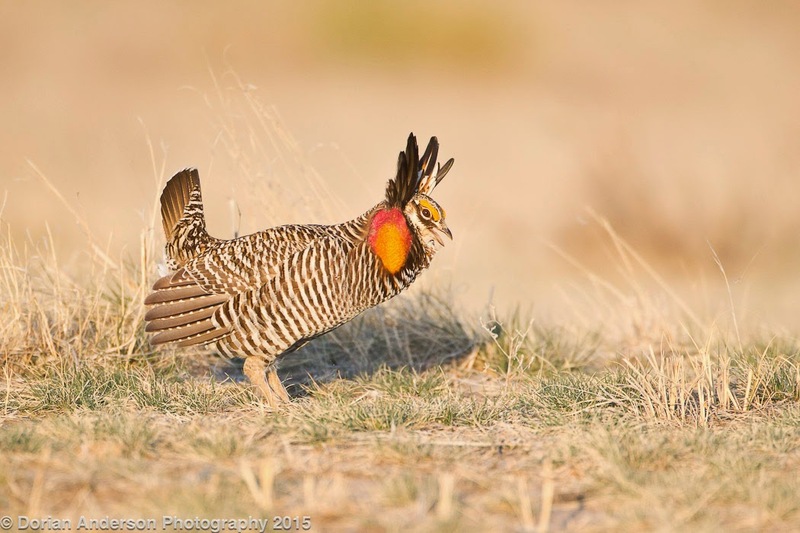 The birds have struggled as their shinnery oak and sand-sagebrush grassland homes have been converted to open cattle ranges and farm fields. 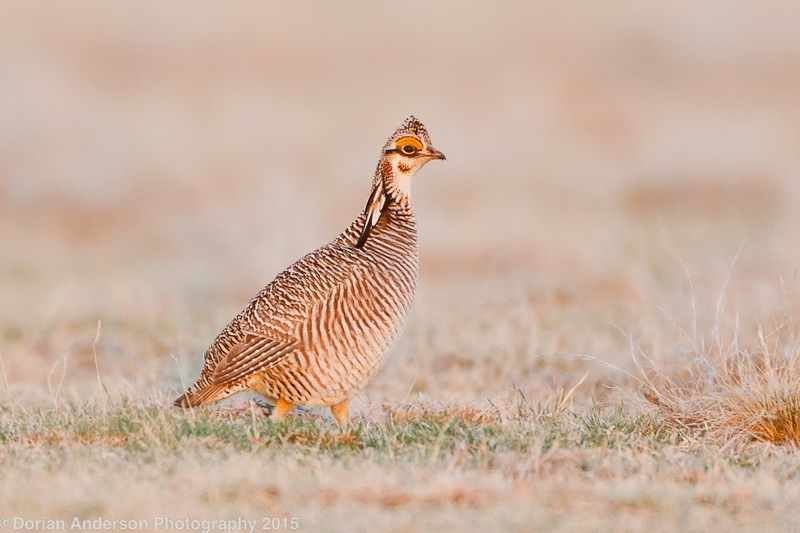 Southwestern Kansas has one of the healthiest populations of the birds, and it was there I headed with hopes of finding this would-be life bird. 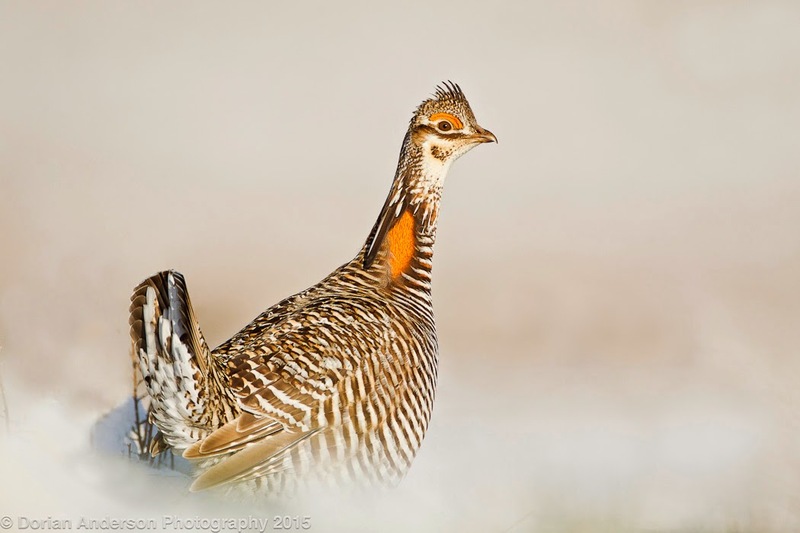 Looking in eBird, there were several recent sightings (in the last week) of LEPC north of Dodge City. I arrived in town late in the afternoon, and, after a brief nap, headed out to the general area of these sightings. Never having birded this area before, I was pleasantly surprised by the number of Ring-necked pheasants I observed. The 20+ I saw on that day were almost certainly more than I had seen in my life until that date. If I am lucky, I get 1/year in the northeast these days. I found the particular prairie-dog town from which LEPCs had been recently reported. Picking through lumps of prairie-dogs Burrowing owls, I methodically found 10 LEPCs hunkered down in the grass surrounding the town. This could not have been easier and fully verifies eBird as an amazing birdfinding tool. The birds were painfully inactive, so I decided to return the following morning under the assumption there would be more activity around day break. eBird checklist of my evening visit. Harris's sparrows were another nice bird. A 5:30am wake-up put me back at the birding area at 6:30 - sunrise was at 7:30. It turns out that the lek was relatively close to the road. Starting at around 7:00am, there was a huge ruckus as 10-11 males cackled, boomed, foot-stomped, and fought with one another in hopes of impressing the limited (1-2) number of females present. This went on for at least the next 2 hours. Some of the birds were still at it at 9am when I finally left. 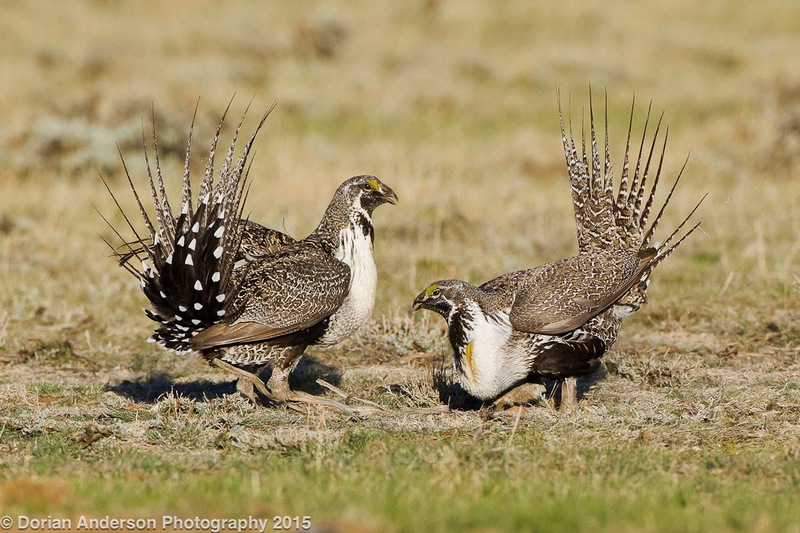 This was my first lek experience, and it was truly a spectacle that I will never forget. 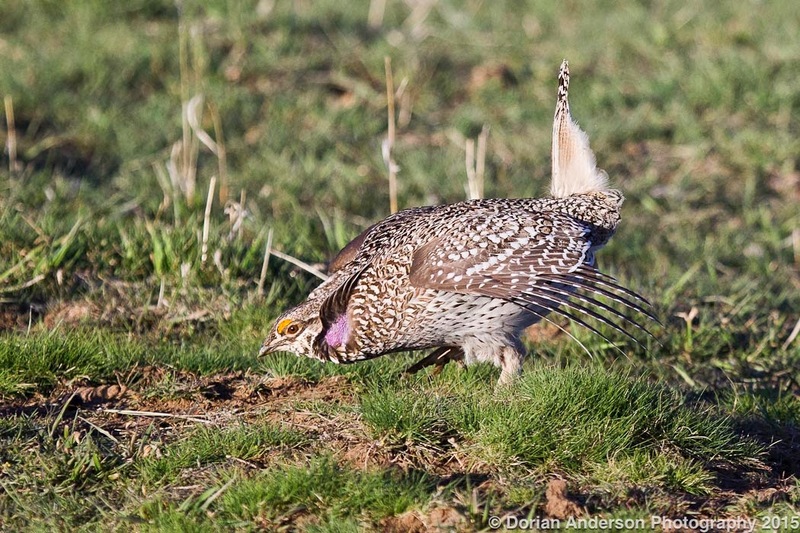 I find it fascinating that this behavior is genetically hard-wired into this and other grouse species. Humans go to dance classes in large part to attract mates. 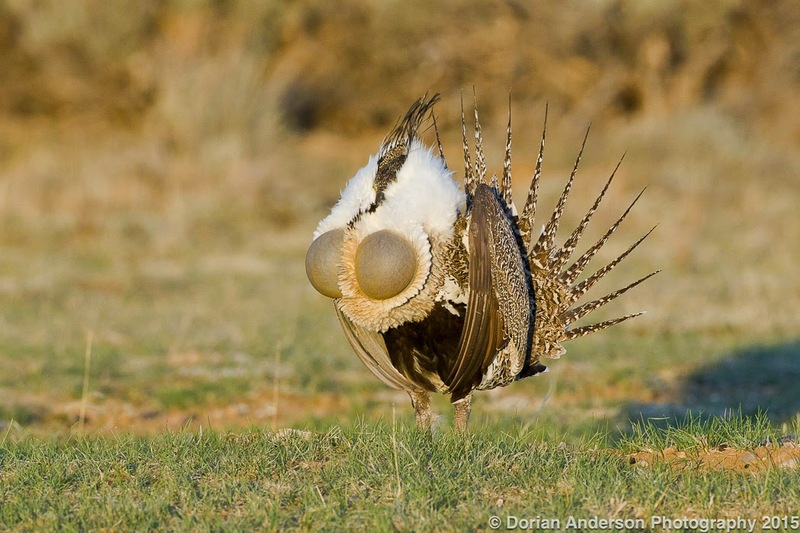 These male birds need no lessons before they perform their highly stereotypes dances. Equally interesting is that females some how discern between what to my eye looked like identical 'Humpty Dances' (best party song of the 90s!). Most of the birds were out of photo range, but one individual did fly in and land with in acceptable range before quickly running off elsewhere. This shot still represents an ~80% crop (kept 20%).